iOS 4.0.2 and iOS 3.2.2 Release Seems Imminent. Backup Your SHSH Blobs Now! There are rumors flying left and right about Apple releasing the iOS 4.0.2 firmware for iPhones and iPod touches and iOS 3.2.2 for iPad in only a few hours from now. This update will patch the PDF exploit which is used by JailbreaMe to jailbreak all iOS devices. If you accidently update to iOS 4.0.2 / iOS 3.2.2, it will be impossible for you to jailbreak and unlock straight away until a new tool is available. The only way you can jailbreak again will be by downgrading back to iOS 4.0.1 or iOS 4 for which you will need your SHSH blobs. A little birdie told me ios update due in a few hours (better to believe than ignore) so go ahead and save your SHSH before it’s too late! 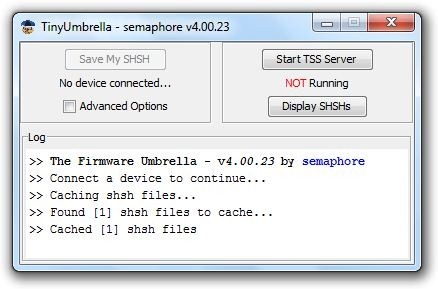 If you are on iPhone 3GS, iPhone 3G, iPod touch 2G/3G or iPad user, follow the complete step by step guide posted here to save your SHSH blobs using TinyUmbrella. iPhone 4 users can follow the guide posted here to backup their SHSH files. If you want to learn more about what SHSH blobs or ECID SHSH files are, you can do so by reading one of my old article posted here. I did this earlier this week. I’m ready! I went 6 months with a shiny paperweight, never again, haha. is it enough is cydia/rock tells me “This device has SHSHs on file for xxxx OS / iOS: 3.1.3, 4.0, 4.0.1” ?? iphone showed only “restore needed” soo i brought it back..
they said maybe ill get a new one..
so no jailbreak 4 me? will this new 3gs come with 4.0.2?